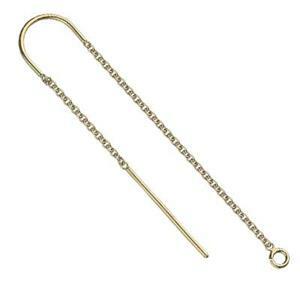 14/20 Gold Filled 1.1mm 21 gauge Cable Chain U-Ear Thread, 1.5mm Open Ring ID. Order 2 pieces to get one pair of earrings. Create seductive linear shoulder duster earrings with this popular threader finding. Ear thread is made with gold filled cable chain and a fixed u-shaped bend to keep the earring in place without slipping. Long dangles at both the front and the back of the design add symmetrical appeal and visually elongate the wearer's neck. A show stopper. Women love this concept.